This issue's cover illustration is from Jill Murphy's All for One. Jill Murphy is interviewed by Joanna Carey. Thanks to Walker Books for their help with this September cover. This well-written collection of linked stories is by the award-winning author of Double Act, The Illustrated Mum, and The Suitcase Kid. Cool teacher, Mr Speed, sets up a super-cool Worry Website for his class. The children are invited to type in a worry and wait for good advice, which often comes from unlikely sources. Holly is worried about the prospect of Miss Morgan, the reception teacher, becoming her stepmother. Greg is worried because he secretly fancies a girl in his class, who turns out to be Holly. Claire's worry is about nightmares whilst low self-esteem is William's problem. He's not too bright and thinks he's useless at everything. Wheelchair bound Natasha would love to be able to take part in the school concert, but she can only communicate through her computerised voice machine. The themes cover familiar Wilson territory and, as you would expect from this author, are extremely well handled. A sixth worry, Lisa's, is written not by Wilson but by 12-year-old Lauren Roberts, the winner of a national competition. 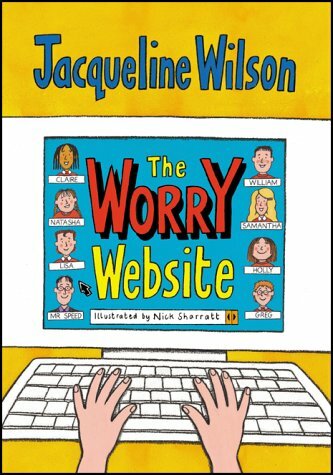 Her Worry Website story, about an abusive father, was chosen by Jacqueline Wilson herself, out of 15,000 entries. It is sensitively written and well deserving of publication.